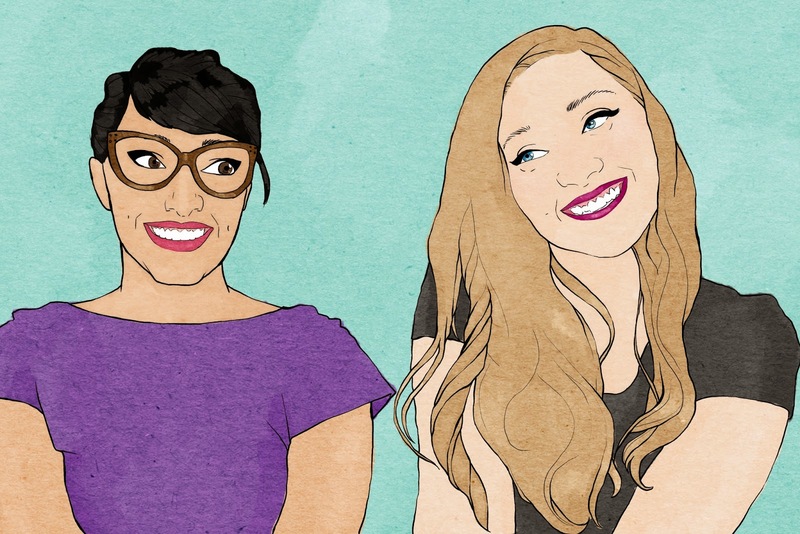 The Spinsterhood Diaries: #3: Make a New Friend! First, let me say that I think today's illustration got a little out of hand and kind of freaks me out. You can't win 'em all, I guess. Especially when you're making a new illustration every single day. So, if my "new friend" in today's illustration looks scared...well, maybe it's because i'm a scary spinster. Aside from today's weird illustration, today's assignment may be a bit tough. The task is this: make a new friend! Obviously, if you do achieve this goal, your life will be enriched, and hopefully your new friends' will be, too. But where will you meet a new friend? Let's review some options. Does one of your current besties have a friend they always talk about? Does that friend sound interesting? Well, perhaps you should ask to meet them! My friend Kelly when I lived in New York was always planning brunches with people who had yet to meet, and I always enjoyed her friends. In fact, I decided to graft many, many of them into my own circle, and Alex was one of them! A little too shy to straight up ask to be introduced? I understand, that could freak some people out. A more subtle way to meet new people, then, is to go to parties you're invited to. OR, you could throw one yourself, asking your guest to bring a friend! There are lots of different kinds of meet ups, and lots of different websites host them. One of the most common ones is actually called Meetup, and their tagline is "Find your people." Meetups are a great way to encounter people who share your interests. There are all sorts of categories, but instead of just explaining it to you, I would encourage you to explore the website. A lot of my friends in New York used to go to Reddit meet ups, but I'm not going to lie. I still can't figure that website out. Does that mean I'm old or a dork? Or both? Or neither? Who can say? So, maybe you've already met someone you'd like to know better....but not that way. Get in some sweet hang time by asking your potential new friend to coffee or brunch. Why knows? You may just follow each other on Instagram later. This one requires a little more time and effort, but I've met some of my coolest friends in class. I took a class at the Upright Citizens Brigade in New York and met my friend Kelly (the scientist, a different Kelly from the one above). Kelly was another thrower of cool parties with cool people. Her parties always included board games or nerds. In other words, she was right up my alley. So make a new friend today! However you do it, it'll be great! Just, please don't post an ad on Craigslist. That's weird.